While Megan and Ryan had talked about adopting in the future, neither one thought it would happen for their family in 2016…until one evening when Megan stumbled upon the picture of a 3-year-old boy named Caleb on a website advocating for waiting children. “I saw him and said to myself, ‘he needs to be in our family,’ even though, at the time, adoption was nowhere on our radar!” Megan recalled. Ryan and Megan discussed adopting for the next several weeks, then sought out Hope International to complete their home study and serve as their placing agency, taking the first steps towards bringing Caleb home. Fast forward 9 months. After pounds of paperwork and months of waiting, Megan and Ryan arrived in Ukraine to meet their new son in early May 2016. “We were expecting him to be a very shy little boy but he was a ham right off the bat…loving, affectionate, and super playful!” Ryan and Megan shared. After completing initial court appearances and paperwork, Caleb’s soon-to-be parents returned to Texas for several days to make final preparations for him. 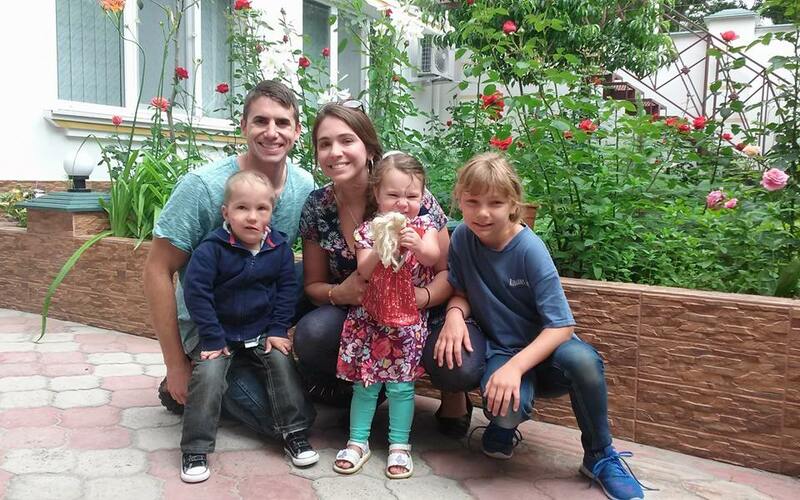 In late May, Ryan and Megan returned to Ukraine, this time with their daughters, Zoe, age 9, and Ellie, age 2. Megan and Ryan remember their first few days as a family of five fondly. They affectionately describe this time as “an overall craziness with the kids running around and playing.” Both parents agree that Caleb fit right into their family, saying, “Adding a boy to the mix who is right between the ages of our daughters just fit really perfectly with our family.” Zoe, Ryan and Megan’s oldest daughter, said she loves having someone to share a room with and play with. She remembers the orphanage where Caleb was living, and told her parents she wants to go back and adopt more kids! Today, Caleb has been part of his new family for almost a year. He loves superheroes, pizza, and playing make-believe. Caleb is thriving in his family! He likes to be goofy and often makes his sisters laugh. “Caleb is loving and affectionate, protective, and strong-willed,” his parents described.